HOUSTON (KTRK) -- Many of us have had that sinking feeling - driving home from work and obeying the rules of the road, when suddenly your rear-view mirror is filled with flashing lights. What are your rights when you're pulled over by police? And how can you avoid getting yourself into additional trouble? Traffic attorneys and law enforcement agree that preparation is key to ensuring that a traffic stop goes as smoothly as possible and increasing your chances of driving away without a ticket. First, keep your driver's license and insurance card in an accessible location so you can quickly locate them. Houston traffic attorney Scott Markowitz says once you've got them handy, stay still. "Reaching up as if you're trying to get something or put something away or grab something - bad idea, very bad idea," Markowitz said. "You want the officer to be at his lowest level of anxiety when he gets to your car." Markowitz suggests just rolling down your window enough to slide your cards through to the officer, when requested. Next, an officer will usually ask questions like, 'Do you know why I pulled you over?' or, 'How fast do you think you were going?" Markowitz suggests drivers stay calm and be respectful, but don't volunteer information. "When you're silent, it makes their job much more difficult because then, they have to make the case, rather than you make the case for them," Markowitz said. Even if an officer asks a leading question, Markowitz says his advice stays the same. "When they say, 'If I search your car, am I going to find anything I shouldn't?' Go back to the silence rule - keep your mouth shut," Markowitz said. But Bellaire Police Chief Byron Holloway says honesty is the best policy with his officers. "We really want voluntary compliance whenever possible," Holloway said. 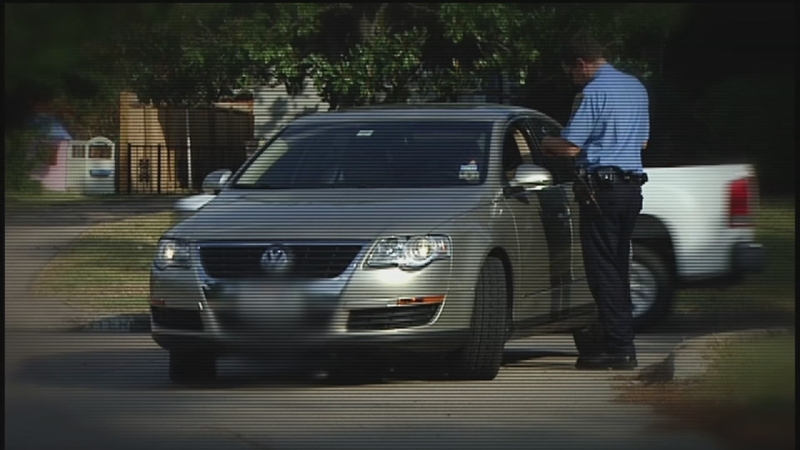 In 2014, Bellaire Police stopped 9,000 drivers for traffic violations, but only about half received a ticket. "It's not something that most officers enjoy. They do it because it's part of their job," Holloway said. If the situation escalates and the officer orders you out of the vehicle, do you have to comply? Holloway says absolutely. "If you refuse, officers can remove you from your vehicle," Holloway said. That's exactly what happened during a traffic stop earlier this year in Addison, Texas. Despite repeated requests from the officer, the driver refused to hand over his license or exit the vehicle. After four minutes of arguing, the officer used his baton to break out the window the pull the driver from the car. "They can still voice their disagreement, but they should not resist," Chief Holloway said. "If you don't want to get out, don't get out," Markowitz said. "But you may be charged with a higher crime than a traffic ticket." High-profile Houston attorney Jolanda Jones teaches black drivers the do's and don'ts of traffic stops. She says it's better to be prepared before you're profiled. "You need to keep your hands up and close the door behind you so the cops can't say you had access to any weapons," she said. Jones also says it's important to roll with the situation. "The most important is be polite and don't have an attitude," she said. "Even though you have a right to do that, I just don't suggest you antagonize anybody who is predisposed to think that you're being disrespectful because they profiled you." Jones' recommendations: Be courteous; provide your name, license and insurance; and at the end of the day, the man with the gun has the say. If you've been wronged, the time to fight it is in court later. Finally, if an officer suspects you've been drinking, experts say you do have the right to refuse a field sobriety test and a Breathalyzer test. But even if you say no to a blood draw, chances are you'll have to do it anyway. "You can refuse, but if there's probable cause to believe you're intoxicated, they will obtain a warrant and they will perform a blood draw," Holloway said. And no matter how much you disagree with an officer, lawyers and police say the worst place to try your case is on the side of the road. "There's never a good reason to fight, argue, bicker, discuss, chit-chat, or otherwise engage in discussion about what's happening to you with that officer," Markowitz said. "It goes counter against the rule: Be silent." Jones, Chief Holloway and Markowitz all encourage drivers to use a cell phone or other recording device to subtly document their interaction with police. Most police departments use dash cams, body cams, or even clipboard cameras to record you, so they say it's only fair for you to have a recording too. "When you see a police car, whether you believe the police car is interested in you or not, turn on the recording device on your phone," Jones told ABC-13. "Don't tell the police." She recommends "Download an app on your phone that records and sends the recording up to the cloud immediately so that the police that manipulate your phone." And if you believe an officer has violated your rights, file a complaint with the police department.